Empties: The hard life of Armenia's "bomzhs"
At about 2 a.m., Artur goes to work. His "job" is collecting bottles in rubbish dumps near buildings. 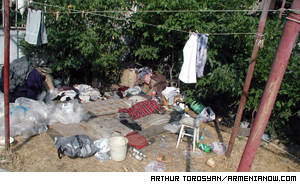 "As soon as you touch rubbish you are a bomzh (vagrant) from that moment on," says Artur. About 250 businessmen, including 150 Diaspora Armenians from 26 countries (Russia, USA, Syria, Canada, Australia and others) met this week in a three-day ""Panarmenian Expo-2003". The goal of the Armenia-Diaspora Congress expo was to present Armenia to Diaspora businessmen as a favorable and healthy investment environment. Seven years ago this week I discovered Armenia. She had been here many millennia before me of course. All my life, though, this whole region had been hidden under the cloak of the USSR, which in my incomplete education lumped everything as "Russia". Seventy-six year old Anahit Atoyan says that early this summer when she heard news about increase of prices of essential goods such as bread, she immediately started to curse the government. But more price increases announced in the past two weeks made the pensioner cry with helplessness. The "ArmMono" Mono performance (monolgoues), the First International Theatrical Festival, has begun in Yerevan and will continue through the weekend, offering performances by local and foreign artists. "Talks about possible reopening of Armenian-Turkish border became more serious especially after the war in Iraq," says Suren Baghdasaryan, a Turkish expert at the Institute of Scientific Studies of the National Academy of Sciences of Armenia. While all around her every morning Yerevan awakens to its dizzy speed of modern living, Armineh Karapetyan finds her way through the chaos of Mashtots Avenue and into the past. Two women tennis players of Armenian heritage have finished their participation at the WTA tournament taking place in Leipzig, Germany this week.